This vast, remote and stunningly beautiful Canadian province has plenty to offer nature lovers and outdoor enthusiasts with its gorgeous scenery, incredible wildlife and abundance of adventurous pursuits. The Yukon really comes into its own during the summertime, when blue skies, warmer temperatures and long daylight hours see locals and tourists alike heading out to enjoy the pristine landscapes and jaw dropping scenery at their peak. And there’s perhaps no better way to explore it all than on two wheels. With its expansive wilderness, rugged terrain and sparse population (meaning it’s all yours to enjoy without the crowds) the Yukon seems almost purpose-built for biking. The territory’s capital, Whitehorse, is undoubtedly the focus for mountain biking activity in the Yukon, with notable destinations including Grey Mountain, Mt. Macintyre and the Yukon River Trail. In fact, there are over 700km of trails spread throughout the city’s area. Of these, around 300km are singletrack, whilst 400km consist of doubletrack and old mining roads. Most of the riding around Whitehorse is smooth cross-country, interspersed with more technical trails and steep descents for advanced riders. The town of Carcross, a 40 minute drive from Whitehorse, is another major destination and home to the fast-growing biking mecca of Montana Mountain. The types of trails to be found in the Yukon range from backcountry dirt and gravel roads (that can get very muddy), to old wagon roads, recreation trails and paved pathways ideal for more causal cycling. Many of these are exceptionally well-planned purpose-built mountain biking trails that are relatively new, having been converted from old mining tracks, whilst other trails are shared with hikers and horseback riders. There’s a fantastic mix of short and long routes to discover, with something to suit every taste and ability level. 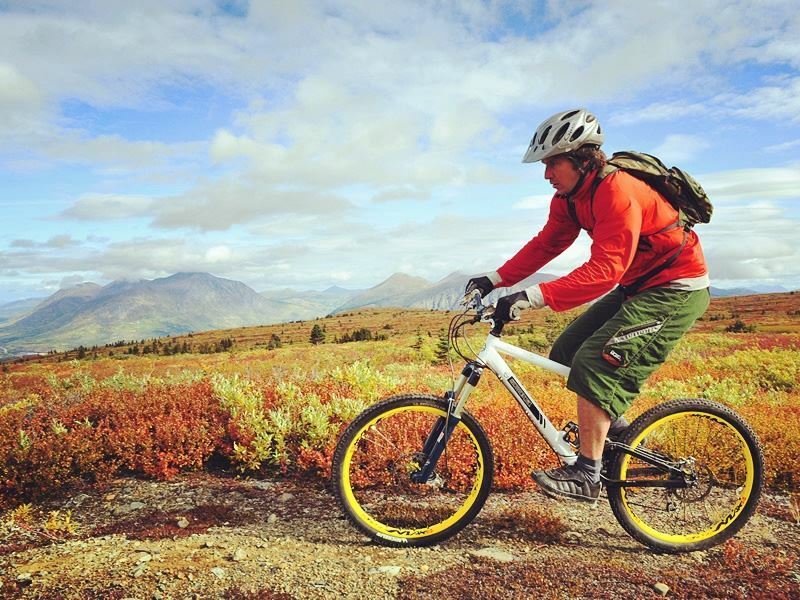 Those travelling through the area by vehicle will find plenty of reasons to stop, rent a bike and spend anywhere from an afternoon to a few days exploring some of the Yukon’s best bike trails. This rocky hill east of Whitehorse forms the core of the area’s trail network with an amazing collection of routes to enjoy, all well-signed, impeccably maintained and including a heap of biking-specific smooth flowing singletrack. Myriad cross-country gravity-assisted trails weave through the wild Yukon backcountry, gently swooping up and over the hilly terrain, diving into dense boreal forests and sweeping past picturesque grassy meadows. As you stop to catch your breath, admire panoramic views over the Whitehorse valley set against a stunning backdrop of snow-capped coastal mountains. Grey Mountain’s trail network is truly world-class, offering an endless array of routes spanning from beginner to expert level, all of which interconnect to provide a brilliant day’s biking without leaving the singletrack. If you’re feeling energetic, you can expect to cover around 30km in about 5 hours of riding. You’ll encounter a handful of technical climbs, but these are instantly rewarded with thrilling downhill runs that provide a real wow factor. Complete a scenic 23km loop starting from Miles Canyon, climbing Grey Mountain and then descending down to the valley via the exhilarating Girlfriend and Juicy trails. These routes offer classic cross-country riding where you’ll cruise through forests thick with trees, emerge onto rocky bluffs overlooking the magnificent Yukon River and eventually connect with the River Trail where further exploration beckons. This is a popular cross-country ski area in winter, but during the summer months opens up to mountain bikers, providing plenty of fun outings for novice riders up. Whilst it used to play second fiddle to Grey Mountain, new trails are continually being added and the network is growing in size and popularity with every season. Mt. Macintyre’s trails are more free-ride inspired than those on Grey Mountain, featuring banked corners and occasional jumps, and is also home to the Dirt ‘n Soul mountain bike skills park. Starbuck’s Revenge is a relatively new addition to the network and one of the mountain’s most rewarding trails. Starting from the summit of Mt. Mac it involves a mind-blowing descent through the alpine, traversing a diverse range of ecosystems until it reaches the Whitehorse Valley. This 30km route takes around 5 hours to complete, so pack a hearty lunch and be sure to spend time along the way relaxing and admiring the stunning views across the valley and out towards Fish Lake. A visit to the Yukon River is a must during any trip to Whitehorse and there’s no better way to appreciate its full majesty than on a thrilling ride along the aptly named Yukon River Trail. The trail has a long and fascinating history, having been established as a hunting and travel route by the local First Nation Southern Tutchone before becoming used by gold rushers in the late nineteenth century. Now the area is home to one of Whitehorse’s most rewarding recreational trails, popular with walkers, bikers, anglers and day-trippers. The trail includes a mix of paved, gravel and dirt pathways and follows the emerald green river along both banks and in both directions from the city centre. Hit the saddle and speed through forests filled with aspen and spruce trees, climb to lofty viewpoints then bomb back down and soar along high cliffs admiring spectacular views in every direction. Besides the riding, the trail also provides access to numerous worthwhile attractions, including the gold rush town of Canyon City, the impressive Miles Canyon, as well as several lakes, many attractive picnic spots and additional trailheads such as those around Chadburn Lake, Chedden Lake and the Hidden Lakes trail network. Lookout points and interpretive signs offer insight into the unique ecology and historical significance of the area, whilst footbridges across the river enable you to complete a scenic loop without retracing old ground. Near the village of Carcross you’ll find Montana Mountain, an old mining site that’s home to over 35km of flowy singletrack (with more continually being added) set amidst some of the Yukon’s most staggering scenery. Over the past decade, these expertly-constructed trails have been created from next to nothing and are being spearheaded by the local Tagish First Nation under the Carcross Singletrack for Success program that seeks to employ local youth and spur community and tourism development in the area. There are two standout alpine trails to explore, MacDonald Creek and Mountain Hero (aka Sam McGee), that crisscross the mountain, rising and falling around 7,500ft and ending on the valley floor at Bennett Lake. Both are fairly challenging and best suited to advanced cyclists. MacDonald Creek is a historic wagon trail converted into a fast-flowing 23km singletrack that traverses beautiful alpine landscapes, offering fantastic scenery, intriguing insight into the local history and non-stop thrills all the way down. Meanwhile, the 28km Mountain Hero boasts IMBA “Epic” status, among only 5 in the country, making it a must for all biking enthusiasts keen to put their skills to the test. Once you’ve conquered the heart-pounding ascent up to 1400m, you’ll reap the rewards of staggering 360 degree mountain views and an awesome brake-burning descent back down to the valley. Along the way, you’ll pass yet more breath-taking scenery, as well as a host of old mining relics and the chance to see caribou and other wildlife. This is an all-day undertaking and the challenging terrain means it’s not one to be underestimated. For a more leisurely peddle, there is also an extensive collection of trails around the lower mountain that will transport you along lake shores, over rocky slabs, through thick boreal forest and across wetlands via wooden boardwalks and bridges. The mix of easy green and blue trails are perfect for novice riders, as well as for more seasoned riders looking to get a warm-up in before tackling some of the more technical xc runs (such as the classic Goat or spectacular Nare’s View). A full list of biking trails in Montana Mountain can be found here. Beyond the main biking hubs of Whitehorse and Carcross, the Yukon offers plenty more opportunities for those looking to explore the territory on two wheels. There are several renowned long haul routes for advanced cyclists or those with time on their hands. These include the Golden Circle route that stretches 360 miles all the way from Haines to Skagway in Alaska, passing through the Whitehorse area, the historic White Pass and Klondike Highway. For more easy going escapades, Dawson City is home to a network of former mining trails that have been modernised providing plenty of opportunities for rewarding short rides. Peddling south from the city, there are miles upon miles of routes to explore, weaving through unspoilt wilderness areas featuring verdant forests, wide rivers and distant mountain ranges. Try the 32km Ridge Road Trail, part of the Klondike Gold Rush heritage route, for a half-day breath-taking biking adventure, or opt for the scenic Waterfront Trail for something more leisurely. As with most of the Yukon, you’ll find the entire area is perfectly suited to cyclists. Roads are relatively low on traffic, there’s the chance to spot some extraordinary wildlife (not least the grizzly bears), as well as plenty of spots to refuel and bed down at remote lodges and peaceful campgrounds along the way.